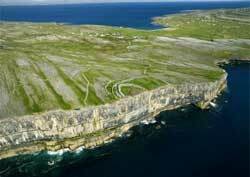 The Aran Islands in Ireland are known for their windswept barren landscapes etched with a patchwork of rock fences. They are also heralded for preserving their traditional Irish heritage. "Big island" in Gaelic. If you can visit only one island, come here. It has the most to offer tourists, including imposing sea cliffs (see photo). "Castle island". O'Brien's Castle is its chief draw. Don Aengues is a 2,000-year-old fort designed with concentric semi-circular stone walls. This site audaciously sits on the edge of a 100 meter (330 feet) cliff. You can take guide tours - or hike or bike for a do-it-yourselfer.